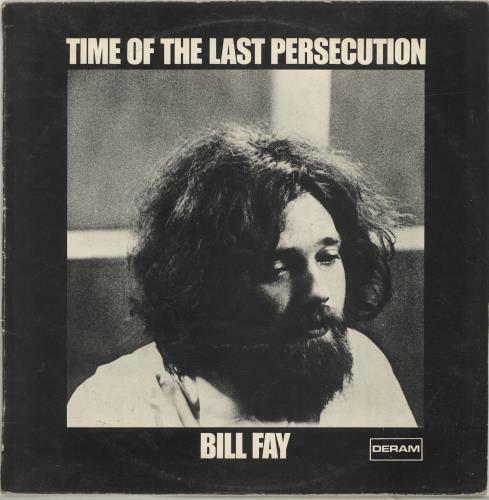 BILL FAY Time Of The Last Persecution (Heart-stoppingly rare 1971 UK 14-track psych-folk holy grail vinyl LP, on the red & white Deram label, matt picture sleeve. 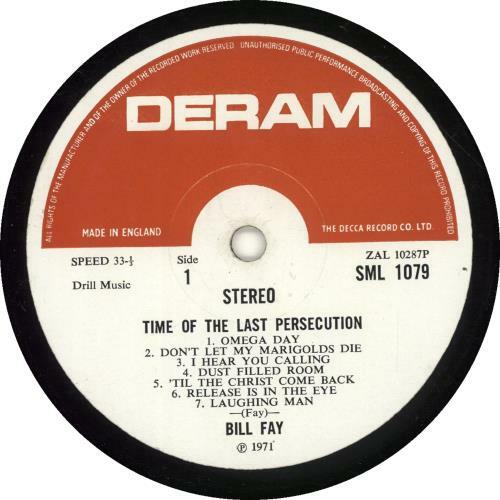 The second & final album by the cult progressive folk troubadour, who would fadeinto obscurity, not to be rediscovered for over twenty years; this album would not be reissued until 2008! This album takes on a slightly harder sound than his first and is based on the books of Daniel and Revelation in the Bible. This is theonlycopy we have ever seen of this fabled album. See 'more info' for further details...). This copy has been enjoyed by its original owner and similarly well looked after. The sleeve is graded as Very Good + and it is quite surprising that it has suvived so well, given that it is unlaminated & matt, leaving it quite prone to wear. The front shows light fading due to ringwear, which is visible mainly in the black areas leaving the haunting portrait of Bill clear & vivid. The top & bottom edges have been scuffed white and are free from splits, whilst the spine has only light scuffing leaving the text nicely legible. The reverse also shows faint ringwear meaning that the text of the sleeve notes is perfectly legible and the photographs clear. Overall there is just the odd light crease here or there, but nothing especially deep. A solid example. The disc is strictly graded as Very Good and has been professionally cleaned on a Matrix machine & play tested. The sound is rich & warm with the bass sounding beautifully deep. There is just a little surface noise at the start of each run-in groove, which due to the acoustic nature of parts of the album can be detected more in some passages than others, although is never obtrusive enough to deter the listener and is free from loud pops or skips. The label displays moderate spindle wear, but there is no paper wear to the hole. The vinyl itself has light paper scuffing, most likely due to the record being taken in & out of the sleeve and a few light hairlines. The vinyl still retains a satisfying deep sheen. 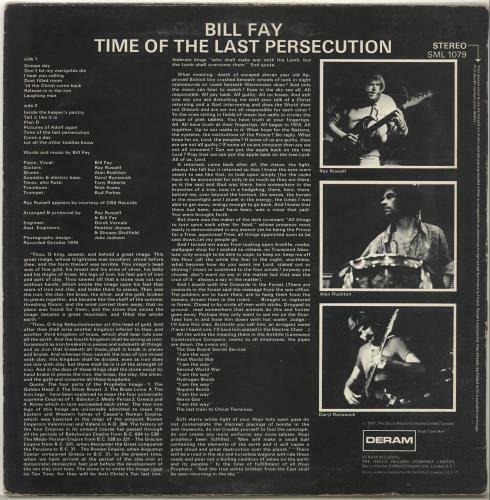 Whilst not a Mint copy, this is very respectable copy of an album that we will in all probability never see again.